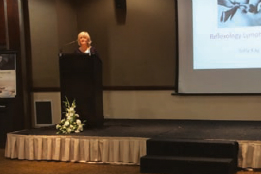 FHT Expert Adviser and 2012 Excellence in Practice Award winner Sally Kay, was a guest speaker at the International Council for Reflexologists (ICR) Silver Jubilee conference in Sheffield. The event was attended by more than 150 delegates from 20 different countries. Sally gave a presentation about Reflexology Lymph Drainage (RLD) – from the early stages of developing this treatment, through to the methodology and findings of the most recent, up-to-date research. Welsh Cancer Charity, Tenovus, kindly funded the latest RLD study, awarding £12,363 to Cardiff Me tropolitan University. News about the publication of this study can be found here. A gala dinner was held at the Grand Ballroom of Sheffield City Hall, during which Sally was presented with the 2015 ICR International Research Award, for the research and development of Reflexology Lymph Drainage (RLD). Greece; Lynne Booth, UK; Marie Muller, France, and Peter Lund Frandsen, Denmark. The next ICR conference will be in Taiwan in 2017. Since the ICR conference, Sally has been asked to be a guest speaker at the 2016 Reflexology Association of America (RAoA), conference in Anchorage, Alaska. 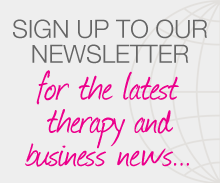 Posted on 22 February, 2016 by Federation of Holistic Therapists (FHT). This entry was posted in news and tagged news. Bookmark the permalink.